Things have been crazy busy at ITFDS since July. Since the National Barbie Doll Collectors Convention, I have been in production mode for the Integrity Toys convention and that left very little time for anything else…taking photos or blogging. I need to work out a better schedule…. obviously! In the craziness that was August through July, there were some very high points for my collection. One such moment was when I won the opportunity to purchase the Poetic Beauty Lilith and Eden gift set. 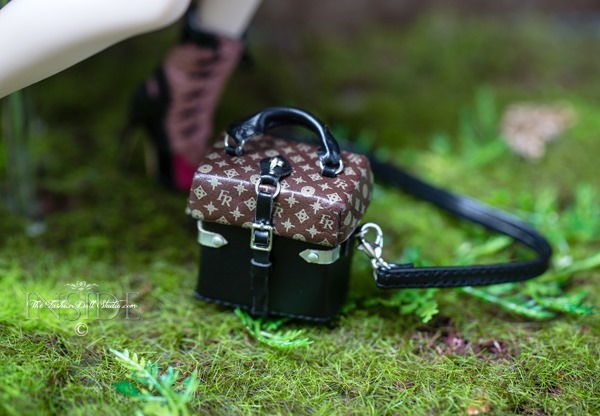 They are inspired, I believe, by the 2016 Pre fall Louis Vuitton collection..feel free to check out the photos in my original post about these dolls. Eden/Lilith is one of my all time favorite face molds and the fact that this gift set was offered in this lottery made me both excited and filled with anxiety. This was a lottery I REALLY wanted to win. I consider myself very lucky to have succeeded in this and was able to purchase. I adore the facial screening on these dolls and the clothing was edgy, current and perfect for these young sister characters. The real highlight, however, in this set were the accessories. It wasn’t the fact that you got 2 Louis Vuitton inspired purses but THE SHOES and those tasseled earrings. The execution and attention to detail on these accessories also deserves special comment. Really well done people…exceptional. And…since the name of this gift set was Poetic Beauty…I had to pull out some Lord Byron….had to do it. This entry was posted on November 6, 2017 by raberry65. It was filed under Eden, Fashion Royalty, Lilith, Nu.Face and was tagged with doll collecting, Doll Photography, fashion doll collecting, Fashion doll photography, Inside the fashion doll studio, Integrity Toys, Integrity Toys 2017, ITFDS, Louis Vuitton, Poetic Beauty Lilith and Eden Blair Giftset, Rebecca Berry Photography, WClub, WClub exclusive, WClub lottery. AMAZING pics Rebecca ❤️❤️❤️❤️They were certainly worth the wait !! Yes, this gift set is a fabulous one with so much attention to detail !! I completely agree with your comments about this set! I too, feel extremely fortunate to have acquired this particular giftset via lottery! Congrats on scoring this set!! Fabulous photos. I was lucky too. Glad you’re back, was missing your inspiring work. Awwww! Thank you my dear. And…so happy you got this set too! And you know what one woman said about Lord Byron – ‘Mad, bad, and dangerous to know’. They are a wonderful set. LOL! ‘Mad, bad and dangerous to know’…ahhhh but oh so good with words.